(Newser) – With Tropical Storm Isaac headed for the Gulf Coast, Louisiana Gov. Bobby Jindal declared a state of emergency today and said he has no plans to attend the GOP convention, CNN reports. 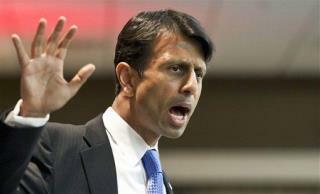 "My priority is the safety of our people," Jindal said. "And certainly as this storm threatens the public safety here in Louisiana, I'm not going anywhere." Jindal is expected to speak Wednesday evening if he attends. Hope he's not sucking off the socialist teat. Oh wait, that only counts if its not Republicans doing it. "Brownie, you're doing a heckuva job"
they said the gulfs waters were currently above 80*. Its the same temperatures that turned katrina into a cat 5. Im really concerned for them over there. please be safe guys...above all else, be smart. GTFO if you see the pattern start to emerge.